At the start of 2018, I told myself that this would be the year that I would complete the Centennials (the highest 100 mountains in Colorado). For no great reason, I wanted to finish my goal before I turned 40 (I'm 39). It was a somewhat lofty goal considering I had lost my job in January, started a new job in February, and was not in the best physical shape of my life. I started this goal officially in 2009 and game out of the gates in a hurry. I had a head-start, having started climbing peaks when I was 4-years-old (1982). I had completed 22 / 100 by the end of 1998 when I was in college, but took a very long hiatus after that. I only completed 5 more peaks from 1998 to 2008. That means that between 2009 and the end of 2018, I completed 73 of the highest 100 mountains. I completed all of the 14ers in 2012. That feels substantial. I completed this goal and took the time to reflect upon that accomplishment by gazing at the stars and the Milky Way from Crater Lake below the Maroon Bells. 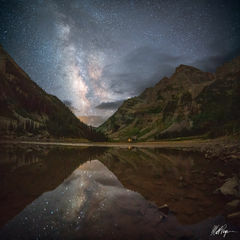 This nightscape fine art landscape image taken within the Elk Mountains commemorates that experience. Featured in this photograph are two 14ers, Maroon Peak and North Maroon Peak.